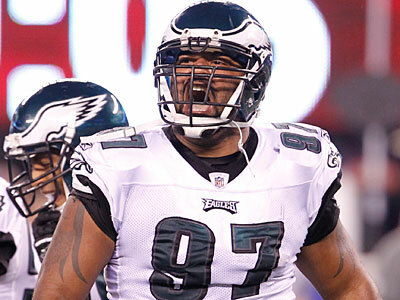 The Eagles made roster moves Monday – releasing a pair of veteran defensive tackles – Cullen Jenkins and Mike Patterson. Selected by the Eagles in the first round of the 2005 draft, Patterson had been the team’s longest tenured player. Patterson leaves having played more games (115) with the Eagles than any defensive tackle in team history. With 114 tackles in 2007, he and Trent Cole became the first pair of Eagles D-linemen since 1991 to record more than 100 tackles in a single season. He was signed through 2016 with base salaries of $2.9 million, $3.65 million, $4.9 million and $6.25 million over the next four years. Jenkins was part of the Eagles’ free-agent spending spree in 2011 when he left the Packers to join Philadelphia on a five-year, $25 million deal. The Eagles were labeled a “dream team” by then-backup quarterback Vince Young after the additions but stumbled to a disappointing 8-8 record that season. Jenkins agreed to restructure his contract last offseason in order to stay with the Eagles. He was due to make $5.5 million this season. hello 3-4! thats what this says. that and chip is goin heavy on defense in this draft. i find it hysterical the same amount of people that wanted kolb over vick, when brady best statistical season was only thng stoppn from comeback mvp bid, now want career 1-5 nick foles to run read option behind revamped oline and hand it off every play and say see? toldyaso! lol! vicks strongest supporters ddnt like andy morhninweg sixty dropbacks a game. t brady hasnt succeded that way. c dillon, spygate and defense is where his (brady) last ring or season comparable to vicks comebck can b attributed. case closed!